"A Book That Will Endure For Years To Come"
"We are taken step by step in a stunning tour of many powerful yet still disputed ideas...that bring age-old controversies into relation with findings in modern physics and psychology." "Bricklin's coverage is ...vast, including eastern as well as western thinking....with persistence one may encounter in it some of the deepest problems in philosophical psychology." "Despite all the interest in James the scholar and James the man, there remains an absence of highly readable books that bring some of the most colorful aspects of James' own thought, along with his somewhat mercurial personal character, to the modern reader. Bricklin's book does remarkable service in this vein, collecting many aspects of James' thought around the general theme of free will, a question that James struggled with his whole life, and which penetrated many dimensions of his thought." "Full of insight and originality"
"Most interesting and profitable...a new and significant light on William James." "The last couple of years have seen a resurgence of interest in William James, one of modern psychology’s most widely respected pioneers....But nothing has quite highlighted the depth of his thought like Jonathan Bricklin’s Sciousness. "This collection is delightful. It brings together important texts from the later life of William James, some of which are not very known, even in academic circles. Jonathan Bricklin's discussion of James is insightful, erudite and illuminating." "Jonathan Bricklin has constructed a definitive anthology that conveys completeness and unity in the presentation of William James's nondual expression. This work is driven by intellectual argument and...elevated by elements of charm and poetry which arise out of the anthology's design and the writings. 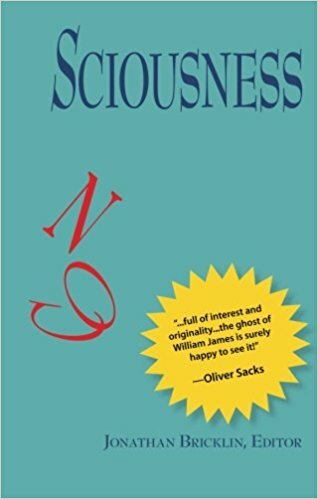 Most importantly, this work is founded in Bricklin's understanding of what nonduality is....Sciousness is a superb anthology, the best possible book imaginable for the discovery of the nondual William James." "Bricklin’s work--Sciousness—should also be widely read for its nondual offering from a Western thinker that runs counter to many assumptions about Western philosophy. I hope that many follow its suggestion and increase the number of studies exploring Buddhism and pragmatism together. Hopefully Bricklin has opened the floodgates."